NEW YORK -- Officials Brian O'Connell and Bo Boroski huddled around the monitor. They asked for more replays of a trap on Purdue's D.J. Byrd and the subsequent raised elbow that sent Villanova's Darrun Hilliard flailing back onto the court. The two officials stepped back again, conferred and after another moment or two, called Bert Smith, the third official, to have a look. There was another conference before O'Connell finally made the call. AP Photo/Jason DeCrow This play involving Purdue's D.J. Byrd and Villanova's Darrun Hilliard turned the game around. He signaled for a flagrant 1 on Byrd. It was his fifth foul. The Boilermakers were ahead 75-71 at the time. Villanova got two shots and the ball. The Wildcats ended up making four free throws after another foul on Terone Johnson away from the ball. The end result was an overtime game, which ended with Villanova pulling away and winning 89-81. It was one semifinal on a Thursday night in mid-November. But it signified plenty for a rebuilding Purdue, a suddenly surging Villanova, and for the way in which a point of emphasis could be called in the future. Officials have ruled that if an elbow strikes a player from the shoulders and above as he attempts to clear space then it's likely going to be called. Hilliard and Achraf Yacoubou were trapping Byrd in front of Villanova's bench. Byrd, who had played a terrific game with 16 points, was being swallowed up and had to clear an area to get a sightline to make a pass. Byrd said he simply caught Hilliard in the wrong spot. He said he could only see Yacoubou but not Hilliard when he turned. The problem may not be with the call itself but more so by how long it took the officials to come up with a consensus. It wasn't conclusive on the multitude of replays and the officials spent an inordinate amount of time deciding. Purdue coach Matt Painter challenged it during the game, but didn't in the postgame. Byrd accepted responsibility. Purdue wasn't able to hold its ground late in the game and ultimately the physicality, which Purdue defined, turned against the Boilermakers. Purdue mirrors its coach and Painter has turned the Boilers into a gritty bunch. But losing to Bucknell at home and now to 'Nova in the 2K Sports Classic semifinals at Madison Square Garden may indicate a longer season. Purdue will fight this season, but if the Boilers can't be composed and finish games then they can't reach the top half of a loaded Big Ten. Villanova was a complete afterthought in the Big East this season and in large part because Wright had no idea what he had. He knew freshman guard Ryan Arcidiacono was a stud if he made shots. He knew he had a strong guard who could excite the Main Line. But he had no clue if his squad -- without a preseason star -- had any toughness whatsoever. And the rest of the Big East will find out soon enough. This was as physical a game as has been played in this brief season and the Wildcats won the fight. Wright said the physicality of the Purdue game can't be duplicated in practice because 'Nova's eighth, ninth and 10th players can't come close to a team like the Boilermakers. Who knows if any of the four teams at the 2K Classic will be NCAA-worthy -- Alabama outlasted Oregon State earlier. But this snapshot a week before Thanksgiving gave us a strong indicator. Villanova grew up Thursday night. And if the Wildcats can translate that into consistent play in January and February then it might be due to the physical style they had to play to beat Purdue. There are season-changing games for teams, even this early. We may have witnessed one for Villanova. There's no sugarcoating the rebuilding job Jay Wright has ahead of him at Villanova. "It's definitely a challenging time for us," said Wright, whose Wildcats finished with a stunningly pedestrian 13-19 overall record, 5-13 in the Big East. "We've got a good core, we're confident in our system," Wright said. "We've got to build it again and prove ourselves again like we did when we came in. There's no shame in proving yourself. We've got to start over. We're not afraid of that. We've got the confidence in our system and our guys. That's where we are and what we're going to do." The Wildcats have lost players to the NBA before, but Wright took a more unusual hit this offseason when his starting guards and top two scorers -- juniors Maalik Wayns and Dominic Cheek -- declared for the NBA draft. Neither were selected. "A lot of these kids are told they're going to be drafted," Wright said. "Both of them expected to be drafted. It's a real challenge in our business now -- to try and educate these kids the best we can." Villanova, which has flourished under Wright on the perimeter, will have one of the more inexperienced backcourts in the Big East. "Inexperienced guards are usually difficult challenges," Wright said. The Wildcats will lean on James Bell, Ty Johnson, freshman Ryan Arcidiacono and Wake Forest transfer Tony Chennault, who is eligible immediately. The returnees aren't household names but the latter two come in with a bit more buzz. "That's a core group right there," Wright said. "It gives us a really good backcourt." The Wildcats will lean heavily on forwards Mouphtaou Yarou and JayVaughn Pinkston. If Bell and Johnson play up to their potential and Arcidiacono is a star, then the Wildcats at least have a core to survive. "We can be a contender for an NCAA tournament spot," said Wright. "If I'm being optimistic than [Bell and Arcidiacono] will play like experienced players. And if they do then we have a chance to be good." Wright has won 12 NCAA tournament games at Villanova. He has coached the Wildcats to a Final Four. The Wildcats are arguably the most popular program in basketball-crazed Philadelphia, and are the only program that plays in an NBA arena for a number of games every season. The Big East is going through a transitional period with the 2013 additions of Memphis, Central Florida, Houston, SMU and Nova's Big Five rival Temple. But Villanova has always been a consistent winner and the Big East needs the Wildcats to be an anchor with Louisville, Connecticut, Marquette, Georgetown and St. John's. The name recognition is too special for it to be otherwise. and everything else will take care of itself," Wright said of the Big East's upheaval. "Since it's a funny time right now, it's very important for us to concentrate on Villanova basketball and try to be the best we can be and let everything else play out. We've got good young guys. I like the young guys we have. There are guys we can build with like when we got Randy Foye and Allan Ray." If that's the case then the Wildcats will be back. But there needs to be patience. This will likely be another transition year, in large part because the Wildcats lost two players early to the NBA draft who were poorly advised. Ultimately, it is their loss as much it is Villanova's. The difference is that it will affect the Wildcats for one season, but may hurt Wayns and Cheek for much longer. Oregon State put the full-court press on Victor Robbins as soon as Jared Cunningham declared for the NBA draft by the NCAA's April 10 deadline. The Beavers nabbed the 6-foot-6 forward from Compton, Calif., to give them a much-needed body up front who has length and athleticism. "After Jared stayed in the draft, [Robbins] will fit in perfectly with us like the guys that we've been recruiting of late," coach Craig Robinson said. "For us to get Victor, the planets had to be aligned. We were aware of him, but not heavily recruiting him and hadn't any big plans to push unless Jared was gone for good." Cunningham made up his mind before April 10, thus allowing the Beavers to get heavily involved in recruiting Robbins. Robbins is Exhibit A for the coaches in the ACC who support the April 10 draft deadline. Those coaches initially pushed for the early-entry draft rule of May 8 and then again last year, when the legislation came through to set a unilateral NCAA deadline of April 10. The NBA still respects only one deadline, which is its own on April 29. Baylor's Quincy Miller announced he was returning to Baylor by the April 10 deadline but then changed his mind before April 29 for the NBA. He couldn't go back to Baylor, but he was eligible for the NBA draft. Maryland's Terrell Stoglin, who was ultimately banned for a year by the Terps for a violation of team rules, didn't say anything by the April 10 deadline but declared by April 29. The purpose of the April 10 deadline was to give college coaches more time to fill scholarships used by early entrants. But it is a selfish rule for the college coaches to not allow the underclassmen to test the draft process anymore. If they declare by April 29, they are no longer an amateur in the eyes of the NCAA. "It's possible that we might not have gotten him if the deadline were April 29," Robinson said. "Knowing in the middle of April helps us just like knowing in March would help us. The earlier that we know the better it is." Villanova coach Jay Wright also benefited from the early notification that two of his players, Maalik Wayns and Dominic Cheek, were declaring for the draft. "It worked out exactly how the rule is planned to," Wright said. "Those two made decisions that allowed us to get involved with two transfers [who] we probably wouldn't have taken if we had those two back." Villanova picked up Wake Forest's Tony Chennault and Rice's Dylan Ennis. Connecticut was in a unique situation. The Huskies, who are banned from the 2013 postseason for poor APR scores, lost Alex Oriakhi to Missouri and saw two other big men -- Roscoe Smith and Michael Bradley -- transfer. In addition, they lost Jeremy Lamb and Andre Drummond to the draft. Adding 6-10 Phillip Nolan in the spring was a result of all the available roster spots. UConn assistant coach Kevin Ollie said that the Huskies offered playing time, and Nolan jumped at the chance. But the early entries definitely did open up a void that the Huskies saw a need to fill. Kentucky knew it was going to be replacing early entrants during the season. Picking up Nerlens Noel late to fill Anthony Davis' spot was planned. It wasn't a result of any early deadline or Davis' inability to test the draft process. The same is true for Duke. The Blue Devils were recruiting 6-7 Amile Jefferson, even before Austin Rivers decided to leave early for the NBA draft. An early-entry deadline had no bearing on the Blue Devils' spring recruiting. "It had nothing to do with the NBA draft," Duke coach Mike Krzyzewski said. "We wanted him on our roster no matter what. He's a great get and a perfect fit for Duke. He certainly solidifies our team and makes our team more athletic." Krzyzewski added that Duke isn't in a position to suddenly add players late (although the Blue Devils were recruiting transfers like Oriakhi and Central Michigan's Trey Zeigler, who went to Pitt). "It's pretty tough for us to do it here," Krzyzewski said of adding late signees who weren't recruited until April. Robbins is a huge addition to Oregon State. But don't think Robinson is in favor of preventing underclassmen from working out for teams to see if they'll be drafted in the first or second round. "I think we should do what's best for the student athletes," Robinson said. "If they can test the market to see where they stood, then they'd have a more realistic opinion of their talents, and we would have an easier job of keeping them in school." Robinson said that he would favor a more flexible approach/rule from the NCAA. "You should be able to come back to your school and finish your eligibility," said Robinson in regard to a player's poor draft status or being undrafted. The latter was once a rule but has since been removed by the NCAA (assuming the player doesn't sign with an agent). "I still think we're in the business of educating kids and getting them college degrees. We would wait to see where Jared got drafted. We would love to have him back. If he didn't [come back] we would have a list of guys to jump on. I think everyone should have a chance to come back one time as a student-athlete." That was once the rule, as late as two seasons ago. And like Robinson, Wright would like one date instead of two. Of course, the early date means the coaches benefit and the players don't. But that's only if they can find a player who fits their program. If it's just a warm body to fill a spot, it won't matter much. If it's a player who will actually contribute and make a difference, it will be a success. Don't expect the Oregon State and Villanova pickups to replace the pro-level talent that's gone. And ultimately that's the reality: Having a unilateral early-entry date may get the school a player to fill the spot, but he's not going to be a star who can replace the production that's left. If it was just about filling the roster and adding length, size or athleticism, it has the potential to be deemed a modest success once in a while for a few schools. • The U.S. World University Games team -- led by Purdue coach Matt Painter (U.S. team head coach) along with Butler coach Brad Stevens and Tennessee coach Cuonzo Martin (U.S. assistants) -- continues to lose key players. Xavier's Tu Holloway turned down the invite to stay and play with his XU teammates. Wisconsin's Jordan Taylor is having minor ankle surgery. And now Painter said that UConn forward Alex Oriakhi is also out in order to rest an injury. Stevens said losing Oriakhi will be a big blow since the team that heads to China next month for the competition needs a rebounder like him in the tournament. Painter said Detroit's Ray McCallum Jr. and UConn's Shabazz Napier were added to the tryout list. Pitt's Ashton Gibbs and Syracuse's Scoop Jardine are still on the roster and are certainly favored to make the squad. • There are still 22 players trying to make the U.S. squad and they'll compete and train in Colorado Springs from Aug. 4-7. The event runs Aug. 13-22 in Shenzhen, China. A number of players could use this international stage as a springboard for their college seasons; these players include Alabama's JaMychal Green, Texas A&M's Khris Middleton, Kentucky's Darius Miller, Northwestern's John Shurna, Minnesota's Trevor Mbakwe, Vanderbilt's John Jenkins, Michigan State's Draymond Green, Missouri's Kim English and Marcus Denmon and Notre Dame's Tim Abromaitis. But perhaps more than any other player, Cincinnati's Yancy Gates needs to make this team and show he can be a force in order for the Bearcats to continue their rise in the Big East. Last season, he was suspended for a game due to team-related issues. Cincinnati coach Mick Cronin said Gates can come out of this looking like a team player and a stronger player who can change his image with a positive performance in China. • Painter said fifth-year senior Robbie Hummel is tired of answering questions about his right knee (ACL surgery). And so are the Boilermakers. He said Hummel should be good to go once the season starts. Meanwhile, the Boilermakers are troubled by the foot surgery for John Hart that will keep him out for an extended period. Hart has had trouble with his right foot for quite some time. • Villanova coach Jay Wright said JayVaughn Pinkston has been cleared by the school to play for the Wildcats this season. Pinkston was not allowed to play last season due to an assault charge. He was expected to have a major impact on last season's team prior to the incident. The Wildcats are prepping for a trip to Amsterdam, where they will play a few national teams. Wright said the Wildcats will be much different than any squad he's coached in recent years, with the team centered more around big men rather than being guard-oriented. 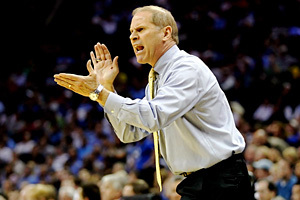 Kevin C. Cox/Getty Images John Beilein is looking forward to the two new guards he'll have on campus this season. • Michigan coach John Beilein said the addition of freshmen guards Trey Burke and Carlton Brundidge should allow Stu Douglass to return to his natural off-guard position. Losing Darius Morris to the NBA draft was a huge blow to the Wolverines, but Tim Hardaway Jr. showed with the U-19 team in Latvia that he can create quite well with the ball in his hands. If the freshmen can be facilitators and Douglass can play off them, the Wolverines may not take a step back. Michigan is in the Maui Invitational in a loaded field, has to travel to upstart Virginia in the ACC-Big Ten Challenge, and gets a sleeper Big 12 team at home in Iowa State. The Wolverines are likely going to add a nonconference game at Arkansas that will take place during the Big Ten season. • While on a recruiting trip in February, North Carolina coach Roy Williams took a side trip to an aircraft carrier in San Diego to see what it would be like in advance of the Carrier Classic on Nov. 11 against Michigan State. The USS Carl Vinson will be the host of the game, but it wasn't the ship that Williams toured. Williams wanted to see how this would work with a game on top of the ship deck. He couldn't get over the narrow passageways through the ship and wondered how his taller players would maneuver through the ship to get to the deck. Well, apparently there will be a lift that will help that occur so that shouldn't be a problem. • Williams isn't ruling out Leslie McDonald coming back this season from an ACL injury. Williams said McDonald will have surgery on Aug. 3 and made it clear there's no reason to make any declarative statements at this juncture about a return. • There was no consensus among the coaches in Orlando about whether to add a stipend, how it would be handled and how it could be divided up for all student-athletes. UConn's Jim Calhoun and Louisville's Rick Pitino said they would like to see $75 to $100 a week for the athletes -- roughly $400 a month. • Not one coach endorsed the NCAA's new draft early-entry withdrawal date of April 10, 2012, after which no player will be allowed to enter the NBA draft. Makes you wonder why this was passed. Every coach who discussed it said it would lead to more poor decisions of players leaving early. • Ole Miss coach Andy Kennedy tossed out this prediction about Vanderbilt: The Commodores are a Final Four contender. • Old Dominion coach Blaine Taylor has gone to the Fred Hill makeover school. Hill, the former Rutgers head coach and current Northwestern assistant, was bald when he was head coach of the Scarlet Knights. Now he's gone with long hair in the back and new glasses. As for Taylor, he got rid of his famed mustache and dark hair. He's gone with something of an auburn or almost light red look. He was standing to the side of our TV set, and I wasn't the only one who had no idea who he was until you could read ODU on his golf shirt. • Stanford is prepping for a trip to Spain in early September. The Cardinal and coach Johnny Dawkins need to get away to figure out who will stand out for them now that Jeremy Green is gone. • New Fairfield coach Sydney Johnson squeezed in a team trip to Italy next month, which will be critical for him to get to know his players more and see how Boston College transfer Rakim Sanders meshes with a team that won the MAAC regular-season title last season and is back almost in full. • The travel some of these coaches put on themselves is a bit ridiculous. Dawkins was in Orlando on Monday, then took off for Phoenix and then Los Angeles before he headed back to Orlando by Thursday. Temple coach Fran Dunphy was in Orlando on Monday and was off to Phoenix before a return to Orlando by the end of the week. • New Maryland coach Mark Turgeon said he has reviewed his team enough to know that scoring up front will be a challenge. He said he'll likely go with four guards on the court on a consistent basis. • Northwestern's Bill Carmody clearly wanted to be noticed in showing his school spirit. He had a rather loud pair of purple sweat pants that I'm not sure you could or would want to buy at the campus bookstore. Michigan State's Tom Izzo went with Spartan green, which Carmody pointed out, but the green was certainly more muted than the purple. Maryland job is elite, but who will jump? To put it simply, Maryland is one of the best jobs in the country. The Terrapins can boast fertile recruiting territory in the Beltway and surrounding areas. Maryland fans are as loyal and passionate as any in college basketball. The facilities are top-notch. Yes, North Carolina and Duke are the perennial favorites in the ACC, but there's no shame in being the third-best job in the conference behind those two. That just means it's among the top 10 or 15 in the country. So why wouldn't top-tier coaches run to College Park if athletic director Kevin Anderson calls to find a replacement for Gary Williams, who abruptly resigned Thursday? Well, after discussing the topic with a number of sources that have direct knowledge on the subject as it relates to these coaches, there are reasons that make moving to Maryland difficult. • How many coaches leave an elite job to go to another elite job when things are going well? • How many coaches in their late 40s or early 50s want to rebuild again if they don't have to? • How many coaches want to go to a team next season that will likely miss the postseason when they have an NCAA tourney team on their own campus? • How many want to re-invent themselves in a new community and go through the rigors of establishing new contacts? • How many are willing to go laterally financially if they're already making millions in their current job? A while back, moving to Maryland from a school like Pittsburgh (see Jamie Dixon) would've been a no-brainer. But now schools like Pitt have emerged as national players, which makes a decision to leave a good situation a tough one to digest. The big-to-big moves of note recently were easy to explain. Roy Williams went from Kansas to North Carolina. That's two of the top five jobs in the country and Williams is a UNC alumnus. Bill Self left Illinois to replace Williams at Kansas, and that one made sense too. Herb Sendek going from NC State to Arizona State was a geographic move and one in which he simply didn't feel appreciated enough at his old school. Ben Howland left Pittsburgh for UCLA. Pitt was a new player in the Big East at the time. UCLA is, well, UCLA and Howland is from Santa Barbara. No need for an explanation. Frank Haith going from Miami to Missouri was an obvious move. Missouri is a much better job. Mike Anderson going from Missouri to Arkansas was an easy choice since he had once coached at Arkansas. But not every situation provides an obvious answer. Mike Brey, Notre Dame: This one seems obvious. Brey, 52, is from Maryland. He has a beach home in Delaware. He coached at Delaware. He played at George Washington. But he also hasn't lived in the area for more than two decades. Yes, Brey had a senior-laden team last season, including Big East player of the year Ben Hansbrough. But the Fighting Irish will be better than the Terrapins next season and Brey feels like he has created his own program in South Bend. He doesn't necessarily have the energy to re-start his career. He loves coaching the Irish and doesn't need a new challenge. If he were in his 40s, he might reconsider. But if he were asked now if he wants to stay at Notre Dame or coach at Maryland, his answer would likely be to stick with the Irish. Jamie Dixon, Pitt: Dixon and Anderson have a special relationship. Anderson was the athletic director who hired Dixon's late sister Maggie at Army. They have shared a closeness since her death. So Dixon will likely be asked by his friend for advice, but it's not likely he will take the Maryland job if asked unless something were to change. Pitt is a Big East power now and has been within a layup of the Final Four. Dixon is entrenched in the Pittsburgh community. There is no reason for him to leave. Jay Wright, Villanova: Wright has built Nova into a Big East perennial power. He has recruiting locked up in the corridor. He has coached the Wildcats to the Final Four. And he is extremely comfortable in Philadelphia. If there is a next move for Wright, it's likely to the NBA. Wright doesn't need to jump to a basketball-football school. According to sources, Wright wouldn't leave Villanova for Maryland. Tubby Smith, Minnesota: Smith was reportedly high on the lists at Georgia Tech and NC State but claimed all along he had no plans of leaving Minneapolis. Georgia Tech couldn't have paid him what he could command anyway. Smith is from Maryland, so it would make sense for him to go home. But is that what Anderson wants? Smith is in his 60s and Williams just retired at 66. Smith is in the same coaching era as Williams, Mike Krzyzewski, Jim Boeheim, Jim Calhoun and Roy Williams. He has coaching left in him, but Maryland is in a rebuilding situation. Yes, Jim Larranaga at age 61 just went to Miami, but the Hurricanes have players and can win next season. Smith is an intriguing name with a national title to his credit, but would he be a long-term solution? Mark Few, Gonzaga: Few has flirted with plenty of jobs in the past, notably Indiana. But he's never bitten. He loves his life in Spokane and with the Zags. He has built a national name at Gonzaga and the Zags recruit at a high level now. He makes over $1 million and is firmly entrenched in the Northwest. He would listen, according to sources, but would he really be willing to go from Spokane to College Park? Does Anderson want to pluck someone who doesn't have any ties to the area, as good a name as he is nationally? Brad Stevens, Butler: Stevens should only leave Butler for a top 10-15 national job after coaching the Bulldogs to consecutive national title games. This is one of those jobs he would have to listen to if called. But Stevens has never worked outside Indiana. Is this the right fit for him? Anderson would hit a home run with this hire. Stevens has become one of the most well-respected coaches in the business in such a short time, drawing immense praise from none other than Krzyzewski the past two seasons. But would Stevens leave the two-time defending national runner-up? Tough call. If Stevens is going to move, he'll likely stay in the Midwest at an elite job in the Big Ten. Mark Turgeon, Texas A&M: Turgeon played at Kansas. He fully understands what it's like to be at a basketball-crazed school. He coached at one in Wichita State. He would enjoy being at a basketball-first school like Maryland. He has done a wonderful job keeping the Aggies relevant in the Big 12 and A&M will again be in the mix in the conference title race next season. But would Turgeon be the choice for Anderson? That's still an unknown. As one source said, Turgeon may not be the news conference name that Tubby Smith would be on day one, but two years into his tenure at Maryland they would know they had an elite coach and a winner. Sean Miller, Arizona: This is by far the most intriguing name. If this were a year ago, Miller would have probably run to Maryland. His first year at Arizona wasn't easy after taking over for two interim coaches who succeeded Hall of Famer Lute Olson. But Miller then coached the Wildcats to the Pac-10 title and a trip to the Elite Eight. He has an elite recruiting class coming to Tucson. This is a great time to be in the Pac-12 at a school like Arizona because it is winnable with so many programs in flux. Unlike Dixon, Wright, Brey, Few or even Stevens, Miller isn't entrenched in his community or the school. He went from Xavier to Tucson just two years ago. He is an East Coast coach, he played at Pitt and coached in the ACC at NC State. So he would be a great fit at Maryland, but is he willing to move after bringing back some of the glory to Zona? Is he willing to start over again and rebuild? Does he have the energy for that type of move again? This might be the most agonizing call. Shaka Smart, VCU: Obviously Smart's name wouldn't have been on this list a year ago. But that was before he coached the Rams to an improbable Final Four run. He committed to VCU by staying put this offseason and the school upped his salary quite a bit. But he would almost certainly jump at an offer from Maryland. The question: Is this too big a leap for Maryland to make? Johnny Dawkins, Stanford: Dawkins is from Maryland. He is an all-time great Duke player. He is trying to establish himself at Stanford, but it doesn't appear he's done enough to warrant interest from the Terps. But he does have a name that would resonate locally and in the ACC. There likely will be others, possibly some names from the NBA. But any list that Anderson checks off should at least begin with the aforementioned coaches. Maryland shouldn't aim for anything less.